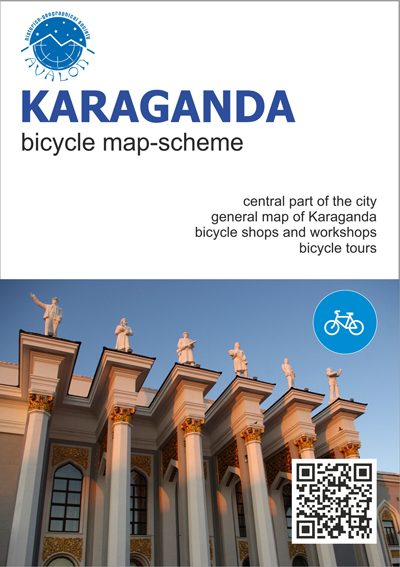 Bicycle map-scheme of Karaganda has come off the press. It had been elaborated by "Avalon" HGS in the framework of the project on bicycle Karaganda development, funded by the US Department of State. The pocket-size edition contains the necessary minimum of information, which will definitely help any bicycle tourist, no matter local or foreign, to make his/her stay in Karaganda extremely interesting. Bicycle shops and rentals, local bicyclists' meeting points, the most interesting sightseeing places of the city, restaurants, hotels, sports and other facilities – all those place were marked on our map. Four bicycle tours, elaborated by our team, as well as their short decriptions, are indicated on the map as well. It is noteworthy, that all the tours mentioned go through the most interesting tourist objects of the city, which have been partly provided by QR-coded signs recently. The map has been issued in 2 language versions: English and Russian. Its dimensions are 29.7 x 42.2 cm – when spread out, 10,5 x 15 cm – when folded-down. The map-scheme is already available free of charge in "Avalon" HGS office. Nearer to the season opening it will be available in bicycle shops of Karaganda and outside the city as well. ll ideas concerning improvement of the map are welcome! We already understand, that it is the first, but not the last version of it. Life is changing, and topography is not an exception. If you find any mistakes in our map or want to add something interesting to it, feel free to contact us.